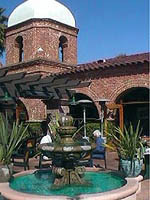 Most of the local businesses, hotels and Restaurants in San Juan Capistrano are family operated and many have been around for years. It's because of this, the visitor to this historic town can get the specialized attention and small town feel that's so often lacking in your basic chain stores. Following are a list of some of the most popular shops, restaurants and places to stay. 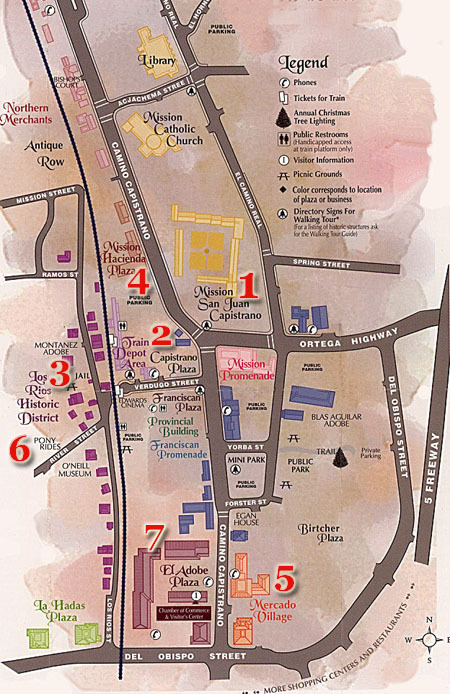 You can locate the location of each establishment by it's corresponding number on the map. Mission San Juan Capistrano, the Birthplace of Orange County, was founded more than two hundred years ago. Today it is a monument to California's multi-cultural history, embracing its Native American, Spanish, Mexican and European heritage. ZOOMARS is home to hundreds of friendly animals to feed, pet, love and learn from. After petting the animals, youngsters can saddle up for a pony ride or hop aboard the miniature train. Ciao Pasta is owned by Chef Pasquale Manta who trained in his native Southern Italy at the age of 20. Indoor and outdoor patio dining with a full bar and extended wine list. The Romance of Old San Juan lives on at Historic El Adobe. Designated a Historical Landmark, El Adobe is steeped in regional history. Dating back to 1778 as one of the Yorba Adobes, it is currently considered on of Orange County's most prestigious and well-respected dining and banquet facilities. Enjoy the finest in American Cuisine while dining in San Juan Capistrano’s historic train depot built in 1894. "Building relationships one cup at a time." Come experience the beautiful Tea House on Los Rios in one of California's most unique and historic neighborhoods. Their handmade scones, loose teas and entrées are delicious and highly acclaimed. Specializing in special events- Baby and Bridal Showers, Garden Weddings, Birthday and Anniversary Parties. ©Copyright Purpose Media. All rights reserved worldwide.